Harvard’s Wesley Saunders drove to the hoop during Tuesday’s game aginst Northeastern. Before Wesley Saunders knew it, his parents were thinking ahead. It started with playing cards. Edward and Ramona Saunders would place them face-down on the table and play “Concentration” with their son. If they could help it, they didn’t want him staring at the television. They wanted him to pay attention to things, to remember them, to think about them. Eventually, they were piecing together jigsaw puzzles as a family. They played Monopoly and Triopoly and Scrabble. But when Wesley’s father sat him down in front of a chessboard, it was for a reason. “I did it just to try to force him to concentrate and learn complex strategy and thinking two and three moves ahead,” Edward said. Edward was planting a seed. So when years passed and Saunders came to a fork in the road — one way leading to college basketball powerhouses, the other to an Ivy League underdog — he thought through all the possibilities. When Saunders committed to Harvard two years ago, the decision was easy to second guess. Before Saunders became the centerpiece of a Harvard team that won the first NCAA Tournament game in program history this year, he was an All-California sectional co-player of the year at Windward School in Los Angeles. And even though the Crimson were coming off back-to-back 20-win seasons, it was hard to compare their newfound success to the Pac-12 big-box operations like Southern Cal and Stanford that were tugging at him. “A lot of people were touting him to have pro potential and he needed to be playing at a school with the exposure of the Pac-12 and they wanted him to play at a more basketball-oriented school,” Edward said. But Edward Saunders knew about such decisions, such chessboard moves. In the 1970s, Edward played defensive back at Iowa during some of the Hawkeyes’ darker years. He grew up in Toledo, Ohio, where Big Ten schools were brand names. Michigan. Ohio State. Purdue. Bowling Green. And he had hopes of playing professionally. During his four years at Iowa, the program was going through turmoil, and he never saw a winning season. He started seeing the game differently. During his own recruiting process, he had gotten letters from Brown, but the idea of the Ivy League was foreign to him. He had an offer from Ohio State, but he would have been staring up at an All-American and an all-conference cornerback on the depth chart. Then he suffered an injury midway through his college career. Along with USC and Stanford, Colorado was looking at Wesley and one of his best friends, Spencer Dinwiddie. 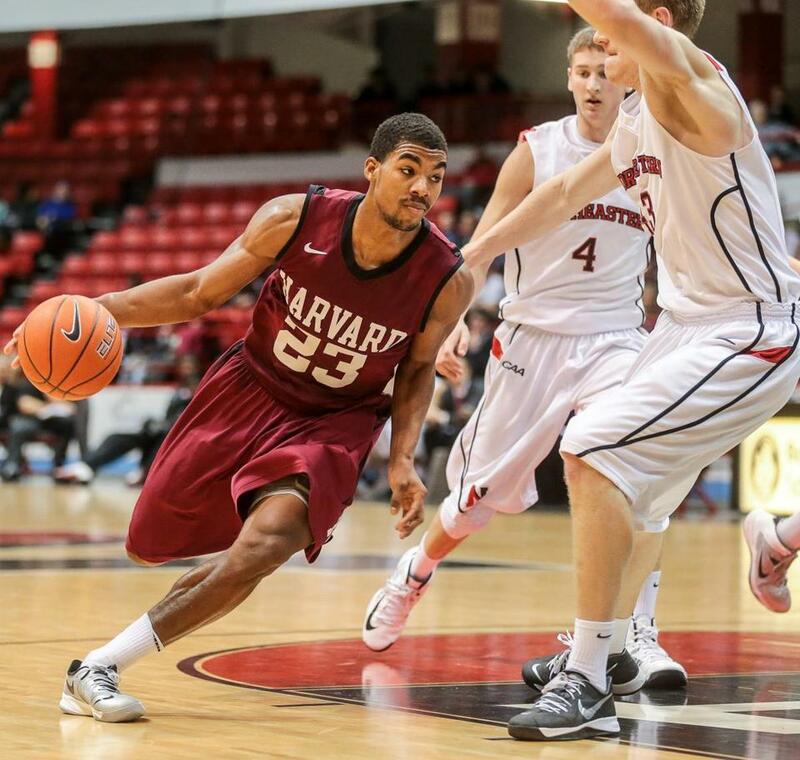 As it happened, Dinwiddie was also on the radar of Harvard coach Tommy Amaker. Dinwiddie’s father mentioned Saunders to former Harvard assistant Yanni Hufnagel. Once Hufnagel got a look for himself, he passed the word on to Amaker. Dinwiddie ended up at Colorado. Saunders chose Harvard. Last March, when the Crimson stunned New Mexico in the first found of the NCAA Tournament, they didn’t have to ask. After averaging 16.2 points, 4.2 rebounds, and 3.5 assists as a sophomore last season, Saunders is putting up 15.1 points, 6.0 rebounds, and 3.6 points for a Crimson team that’s off to a 8-1 start. He has a natural ability that makes getting to the basket look like performance art. But his approach to the game is logical and thought-out. Last season, Amaker practically lost count of all the things he asked Saunders to do, whether it was guarding the other team’s best player, carrying the scoring load, creating offense for others, or hitting the glass. He also knows that the load never seems heavy. Saunders’s demeanor is constantly calm. “I think that’s something that’s just always been natural for me,” Saunders said. “I try not to let my emotions get too involved in the game. Every now and again, Saunders and his father will still break out the chessboard. “He’s got me as of late, put it that way,” said Edward. When they look at the way things have played out at Harvard, they can agree it was the smart move. “I think everything’s really worked out the way we envisioned and it’s really a blessing to be able to go to this university,” Saunders said. His parents see the success on a larger scale.